While the Peoples Republic of China is officially an atheist country, Christianity continues to experience rapid growth on the Chinese mainland. Many observers see the country as on the way to becoming ""the world's most Christian nation."" Yet there is widespread ignorance in the English speaking world about how the Chinese Christian community fared during the decades prior to China's ""opening up to the West"" in the aftermath of the historic visit of Richard Nixon to Beijing in 1972. 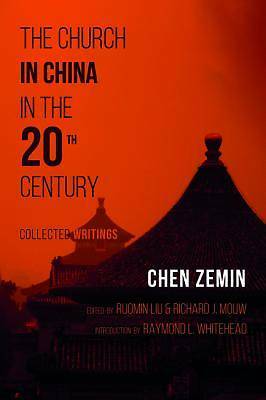 This collection of essays, the first of them published in 1939, provides an invaluable record of developments in mainland Chinese Christianity during that period and for the remaining decades of the twentieth century. The fact that the essays were all authored by a key participant in the Protestant churches in China provides significant added value. Professor Chen discusses a wide range of important topics: various stages of rural and urban development, the ""Three Self"" principles for structuring officially sanctioned worshiping communities, Bishop K.H. Ting's advocacy of a genuinely indigenous Chinese theology, patterns of international cooperation, worship, seminary education, and much more. These essays make a unique and significant contribution to the Western understanding of Asian religious life in the twentieth century. ""Chen Zemin has been one of the most significant Chinese Protestant intellectuals of the state-sanctioned Three-Self Patriotic Movement. A first in the English language, this wide-ranging collection of essays engages topics from hymnology and Christian social work, to a cosmic Christology and a theology of reconciliation. It offers readers a glimpse into Chen's important thinking, which has helped shape the development of Chinese Christianity today."" --Alexander Chow, Centre for the Study of World Christianity, University of Edinburgh, and author of Chinese Public Theology Zemin Chen was born in 1917 and began his active service to the Chinese Protestant churches a decade before the revolutionary events that resulted in the establishment of the People's Republic. He taught from 1979 to 2009 on the faculty of Nanjing Union Theological Seminary, where he also served as academic dean and vice president. Chen is a gifted poet who has written many Chinese hymns. Richard J. Mouw earned his PhD in Philosophy from the University of Chicago, and he taught for seventeen years at Calvin College. Mouw then served as the president of Fuller Theological Seminary in Pasadena, California, for two decades. In 2013 he stepped down and became the professor of faith in public life at Fuller. He is the author of many essays and books, and has lectured and preached widely in China. Ruomin Liu was born in China in 1978. He studied theology in Nanjing, and then in Heidelberg, Germany. His doctoral dissertation on the ecclesiology of Dietrich Bonhoeffer was published in 2014. He has served as professor of systematic theology of Nanjing Union Theological Seminary, and has been one of the heads of the Academy of Mission at Hamburg University since 2016. Liu has published widely on theological topics in Chinese and in German.